Last week, I bought some piping bags to make butter cookies. 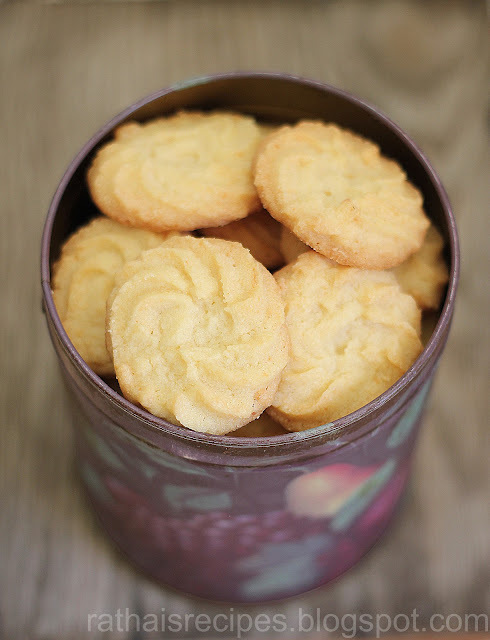 I have been looking forward to making these piped butter cookies for a long time. I have always adored cookies. As children, we loved cookies so much so that we refused to eat proper breakfasts and would instead feast on cookies first thing in the morning. Though we have outgrown that habit, I still have a soft corner for cookies. So while baking these I wanted to recreate a childhood favourite, assorted cookies. I love the idea of assorted cookies and therefore went ahead making cookies with different flavours using the same cookie dough. Cut the butter into smaller cubes and place in a cold bowl. Sift the icing sugar into the bowl with the butter and whisk until well-blended. In a separate bowl, mix flour, salt and baking powder. Sift the flour into the butter mixture. Whisk until well blended. Pat together the dough with your hands. Divide the cookie dough into 4 equal parts. If you live in a country with a humid climate, I'd advise you to wrap up the dough in a plastic sheet and place the parts, except the one you are working with, back in the fridge. If the butter melts too much, the cookies wont hold up their shapes much when baking. To make the vanilla-flavoured cookies, you need a vanilla bean or vanilla bean paste or vanillin sugar. Take one part of the divided cookie dough. Add the vanilla bean paste and knead it until well-blended in the dough. Place parchment paper on an oven sheet. Fix the pipe to the piping bag. Add the cookie dough in the bag and squeeze out in any shape, you desire. You can either pipe out the cookies (which is the best option) or use a cookie cutter to shape the cookies. This was the only cookie I did not pipe out because when I was wondering what shape to give the vanilla-flavoured cookies, I came to think of this famous rhyme in Tamil "Nila, Nila odi vaa", because of the name vanilla (Va-Nila). Vaa means come and Nila means moon in Tamil. Typically, mothers sing this rhyme to entertain their babies when they feed their children rice at night when the moon is visible. Before baking them, you could put them in the fridge for 10 minutes or so (before baking them), if they are too soft (which means the butter has softened too much), because there is a risk that the cookies wont hold their shapes while baking. Bake the cookies in the middle rack of a pre-heated oven at 180 C (360 F) degrees until nice golden colour around the edges. Take the cookies out and let them cool on a wire rack with the parchment paper. When you take them out from the oven, they will still be soft and they will get crispy after cooling down. To make this nut-filled cookie, roughly chop 3 tablespoons of almonds or hazelnuts. Knead in the chopped nuts until well-blended with one of the remaining 3 cookie doughs. Place parchment paper on an oven sheet. Fix the pipe to the piping bag. Add the cookie dough in the bag and squeeze out in any shape you desire. Bake the cookies in the middle rack of a pre-heated oven at 180 C (360 F) degrees until nice golden colour around the edges. Take the cookies out and let them cool on a wire rack with the parchment paper. When you take them out from the oven, they will still be soft and they will get crisp after cooling down. After cooling down. Melt the nougat in a small heat-proof bowl in the microwave. Take the cookies and dip them, one by one, on only one side and place them back on the parchment paper and allow to stiffen. The inspiration for this cookie is my most favourite character, the detective Hercule Poirot. If you are familiar with this character, you know that Poirot is an epicurean who is attracted to all the finer things in life. The cigar is made of finely chopped nuts, I used almonds, and then dipped in nougat, to symbolize his exquisite tastes. Chop off an inch of fresh ginger root. Peel it and cut the ginger finely and then grind into a fine paste with a mortar and pestle. Squeeze out some of the water from the ginger, otherwise the short-bread like cookie dough will become messy and sticky because of the additional water. Now, take one of the remaining 2 cookie doughs and place it in a bowl and knead the ginger into the cookie dough. Place parchment paper on an oven sheet. Fix the pipe to the piping bag. Add the cookie dough in the bag and squeeze out in any shape you desire. Bake the cookies in the middle rack of a pre-heated oven at 180 C (360 F) degrees until nice golden colour around the edges. Take the cookies out and let them cool on a wire rack with the parchment paper. I chose to call these ginger-flavoured cookies Plain Jane. It is a tribute to the character Jane from my favourite book Jane Eyre, whose life is full of sadness and misery. The ginger was added to symbolize the "sting". To make the coconut-flavoured cookies, measure up 1/3 cup desiccated coconut flakes. In a dry grinder (food processor), grind the flakes until fairly powdered. In a bowl, take the last and remaining part of the divided cookie dough. Add the coconut flakes and knead it until the flakes are well-blended in the dough. Place parchment paper on an oven sheet. Fix the pipe to the piping bag. Add the cookie dough in the bag and squeeze out the cookies in any shape you desire. Bake the cookies in the middle rack of a pre-heated oven at 180 C (360 F) degrees until nice golden colour around the edges. Take the cookies out and let them cool on a wire rack with the parchment paper. When you take them out from the oven, they will still be soft and they will get reasonably crunchy after cooling down. I love coconut so the fourth cookie had to be coconut-flavoured and I named it Coconut Delight. It's a delight to anyone who loves coconuts. hey different shapes are looking so nice. I like chocolate dipped cookie. wonderfully baked butter cookies,looks perfect..seems you have used pastry bags n pipes to make these butter cookies,lovely shaped...looks too tempting!! These looks really pretty ! Love the beautifully piped shape so as the different flavor that you've added ;)Lovely presentation and awesome photos , too ! Oh, these are gorgeous!!! You did a fabulous job with the piping...and your flavors sound wonderful! Your cookies looks buttery and delicious! I love butter cookies with a cup of black coffee! awesome and very cute shaped cookies.. The cookies look like a pro's work!! They look great and so irresistible. I love the additions that you have made. Awesome post dear! Well done! 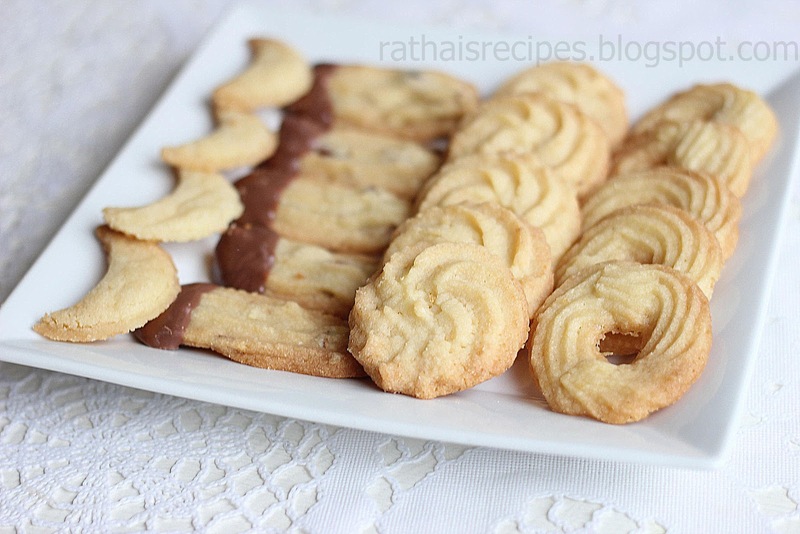 Just mouth-watering...butter cookies are one of my favs anytime....looks delicious! Looks very yummy. First time here and you have a wonderful space. Thanks for linking to my event! I was just looking at some of these in a cookbook! It has been ages since I have made any piped cookies, so this does inspire. Your cookies here not only look delicious, but they have a very professional appearance! You do have some talent for making them. Enjoy the weekend. Gorgeous clicks and tempting cookies. Thx for linking to the event. wow! love the shapes, looks absolutely fabulous! I love these crispy cookies. Those are some awesome collection of cookies..:)..I am sure my kids will love these..thanks for sharing.. Thank you, one and all, for your encouraging comments.